Sir Ian McKellen’s the star of my post today. Last Sunday, sat in the theatrical darkness at the City Screen York, knowing the sunshine was glittering on the River Ouse outside, but I did not care. The day was McKellen’s birthday, so there was a special “Live from London’s South Bank” screening, celebrating his life and work, with lots of clips, photographs, moments recreated from his childhood and early life, extracts, interviews and more. The sunshine was well lost that afternoon. So what did the wonderful Sir Ian say or do that I can share in today’s post? McKellen explained the audience can’t always see facial expressions so stage actors use their whole body to create the character: the stance, the silhouette, the meaningful gestures. He devises a walk for every one of his characters, a variation of the writing workshop exercise that begins with an imagined pair of shoes or boots. So, say I, use your writing to help your reader see your character; make use of those significant gestures and traits – but don’t overdo it, darlings!. McKellen, as a young man, was taken on by the National Theatre Company, then at the Old Vic in London. After a while, feeling he was playing to tourist audiences, he moved back north to the audiences he felt loved and knew the theatre, and where he could play a variety of repertory parts and gain more experience. So, say I, keep studying, learning, keep your curiosity. Try out new things away from the brightest lights. Who is your reader? Who could be your reader? 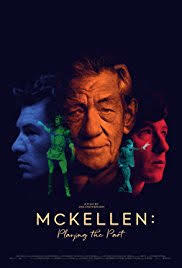 The famous places aren't always what you need..
McKellen, after he came out as gay, felt his confidence in his work and self grew and he felt he became a better actor. So, say I: be authentic, be the writer you are inside - even as you keep learning and working. McKellen, as a young boy, was frequently backstage at his local theatre. He was was always interested in the other people there: the players, the artistes. the costume makers, the technicians and all the backstage hands. When he got into film, he found all sorts of people there whose purpose was to support you in your acting work, to help you be the best actor you can be. So say I, although being a writer is a solitary task, if and when you are being published, lots of other people will be involved in the process. Learn about their roles and work and what they can or might be able to do to help you. Be friendly and interested in all the other people who look after your book. McKellen, at the end of one poignant bit of film – the last show of Godot - suddenly escapes to a quiet room and weeps, not knowing his mic was on. He believes this is the last time he’ll act and the sound is heartbreaking. Wise words, Sir Ian and Penny! Thanks! There were lots of other moments but I didn't want this post to get too long. He mentioned his first two scenes acting as Gandalf. On the first day, he was put into costume and made up as Gandalf appears at the start of the trilogy and filmed. He didn't know what hobbits were, he said, so after having them explained, he put on what he thought was a suitable expression. Then, the day after he was got dressed up as Gandalf for the wizard's final scene at the very end of the trilogy. What's happened? he asked but got the scantest reply. So he just gave the most neutral look he could. And it worked, he said, because by the end of the trilogy, the audience all knew the story and could fill in all of the emotions that moment needed. What an interesting post, Penny - and full if wise words from you both! Amazing actor! I saw him here in King Lear some years ago, with Sylvester McCoy as the Fool - wow, for both of them! A bit strange that he hadn’t at least read the script before filming that first scene as Gandalf, though. I read somewhere that he took the trouble to use Tolken’s voice(and he really did sound like Tolkien), so why not bother to find out a bit about the story of the film he was about to do? Puzzling. Still, he was a wonderful Gandalf anyway. Hopefully the bio film will travel Down Under. I think he's doing another Lear quite soon! This was a wonderful post which I came late to and read only after mine was posted today... odd that some of your 'And so say I' matched up to some of the things I was trying to put across in my 12 Tips but not as eloquently. Thank you Penny.